Gee, J. M. 2003. How a hybrid zone is maintained: Behavioral mechanisms of interbreeding between California and Gambel's Quail (Callipepla californica and C-gambelii). Evolution 57(10):2407-2415. Gee, J. M. 2004. 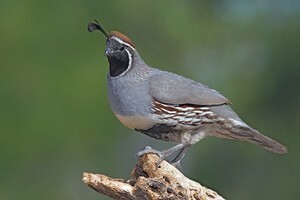 Gene flow across a climatic barrier between hybridizing avian species, California and Gambel's quail (Callipepla californica and C-gambelii). Evolution 58(5):1108-1121. Gee, J. M. 2005. No species barrier by call in an avian hybrid zone between California and Gambel's quail (Callipepla californica and C-gambelii). Biological Journal of the Linnean Society 86(2):253-264. Guthery, F. S., N. M. King, W. P. Kuvlesky, S. DeStefano, S. A. Gall, and N. J. Silvy. 2001. 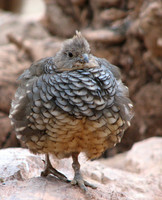 Comparative habitat use by three quails in desert grassland. Journal of Wildlife Management 65(4):850-860. Hagelin, J. C. 2002. The kinds of traits involved in male-male competition: a comparison of plumage, behavior, and body size in quail. Behavioral Ecology 13(1):32-41. Hagelin, J. C. and J. D. Ligon. 2001. Female quail prefer testosterone-mediated traits, rather than the ornate plumage of males. Animal Behaviour 61:465-476. Zink, R. M. and R. C. Blackwell. 1998. Molecular systematics of the Scaled Quail complex (genus Callipepla). Auk 115(2):394-403. Page: Tree of Life Callipepla. The TEXT of this page is licensed under the Creative Commons Attribution-NonCommercial License - Version 3.0. Note that images and other media featured on this page are each governed by their own license, and they may or may not be available for reuse. Click on an image or a media link to access the media data window, which provides the relevant licensing information. For the general terms and conditions of ToL material reuse and redistribution, please see the Tree of Life Copyright Policies.